Do I have a Fiji Dwarf? I just saw a post with a bunch of Fiji dwarf coconut trees and since I'm not a palm expert, now I'm wondering whether I have a true Fijian. 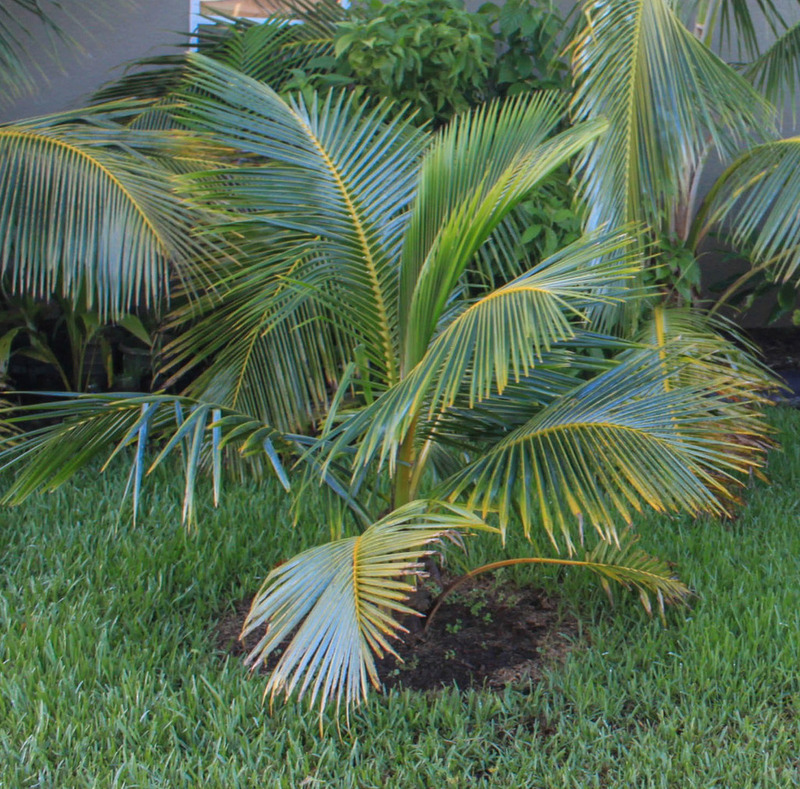 I do have two "Fiji Coconut trees". I've been growing both of them from seed. 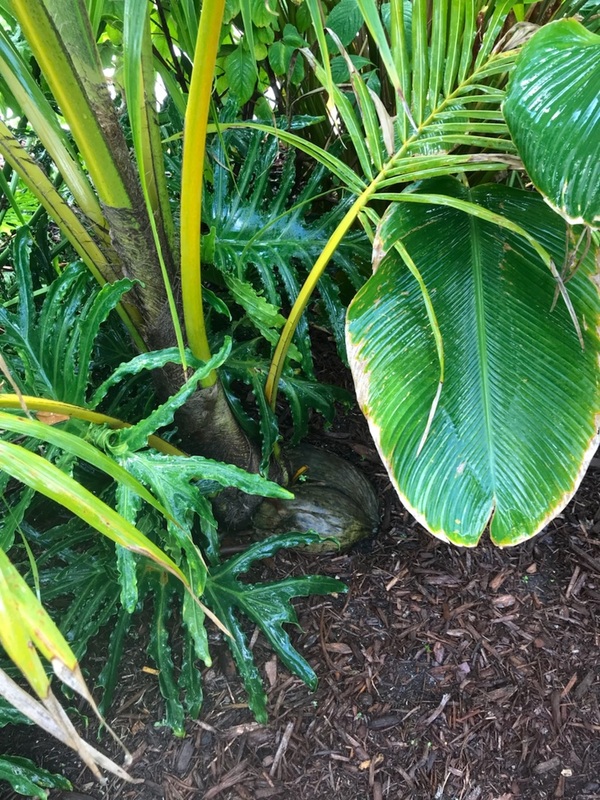 The oldest one came from Puerto Rico as a Samoan Dwarf (first picture) two and half years ago and now it's approx 16 feet tall - one thing I have noticed is that it's developing a swollen trunk base (no visible trunk yet) and the fronds are nicely green, which goes in accordance with the Fiji Dwarf variety. 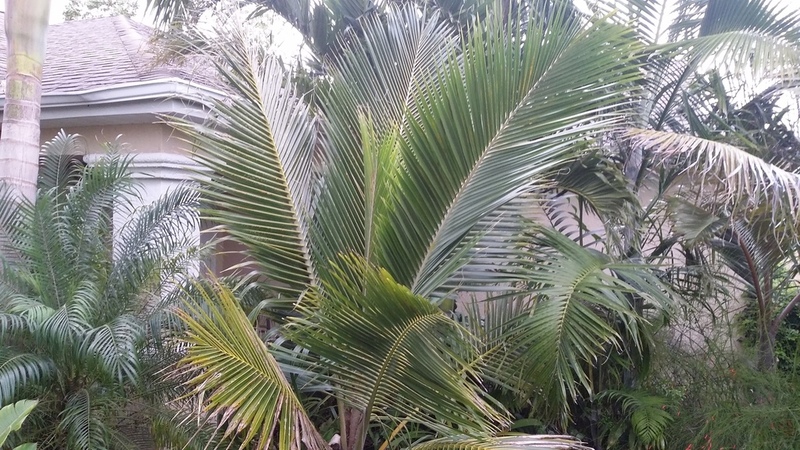 The second one I bought it on Ebay from 7_Heads on August of 2016 and sprouted on Nov 2016 - this one is now approx 7 feet tall and came out from a nut that is double the size of a normal coconut, but the fronds are more yellowish. Thanks a lot for your expert opinion!! They look really good, but to answer your question, I honestly don't know, since I am not nearly as familiar with the Fiji Dwarf as I am some other varieties. Hopefully, Keith in Palmetto, FL will chime in here. I think he knows a lot more about them. 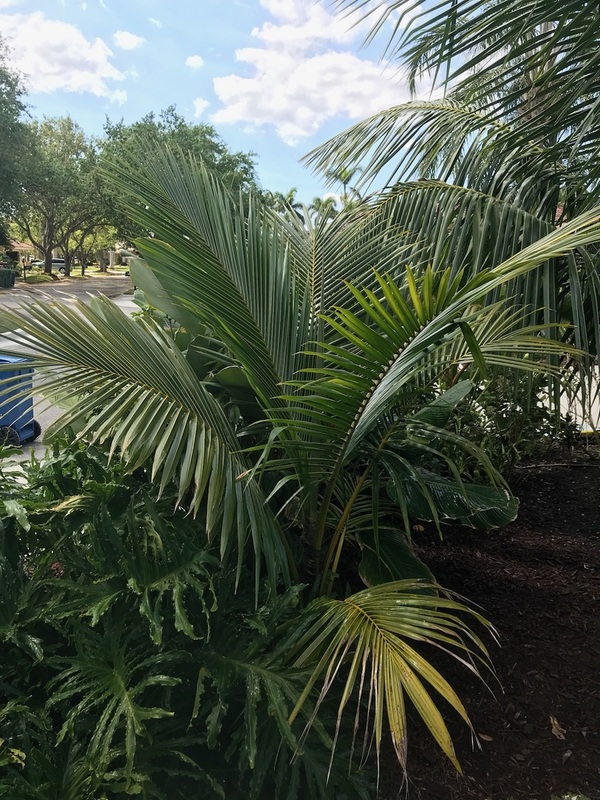 I have a young one that was sent to me by someone in the Pine Island area, but it is still young hasn't had its leaves split into the adult pattern yet, but it does seem to have a fatter trunk like the Fiji Dwarfs do, especially at such a young age and small size. My opinion. First one looks like a tall variety. The second does look like a dwarf. Don't know if it's a Fiji or Malayan though. Just my opinion. I am no expert. 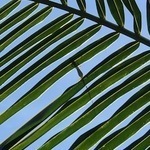 The Fiji dwarf does have a longer overall frond length than the other dwarf cultivars. Hard to tell at this stage. First one's not a Fiji Dwarf (sorry). Second one looks good though. I'll attach a pic of mine at about the same size. The variety is distinct in that the leaflets are very close together and seem to stack on top of each other once the tree is large enough. It's hard to see in pictures, but very easy to see in real-life. Also, the Hawaiian strain of Fiji dwarf (called Samoan dwarf over there) has gigantic coconuts that hold up to 2 liters of coconut water in them, so your report on the huge coconut from the second one is consistent with that. Thanks everyone for your comments. Yes, I agree that the first one is most likely a tall one and the second one really looks very similar to Zeeth's. Let's wait and see how quick they produce seeds to really tell. I actually thought Fiji had smaller fronds compared to most coconuts, maybe even compared to Malayans, but wider leaflets and more density. Here's some nice ones I spotted on streetview in Hilo, HI. I would love to have one of those. Quite easy to protect before and during their first, second and third harvest. They don't require the foliage space the semi-dwarfs and talls do. At this stage I would swap my B. alfredii's plot (in a heartbeat) for a true Fiji dwarf. (please message me if you happen upon one). Danke. 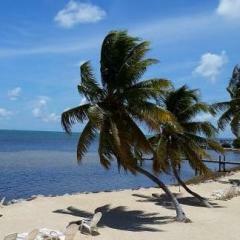 I recently became very interested in coconut palms, and found my way to this forum, where I've found the highest quantity of quality palm tree growing knowledge! 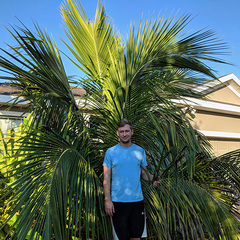 There seems to be a lot of knowledgeable people with great dreams (and successes) in growing beautiful palms in sometimes incompatible environments, and I think it's awesome! All that being said, just in theory and as a thought provoking question, do you all think it could be possible to grow a coconut palm in a greenhouse? Imagine you were in a location that obtained enough sunlight throughout the year to sustain them, were able to provide the proper environment for it, but just had too cold of a winter. Would you simply be able to make proper conditions for one by growing it in a greenhouse? 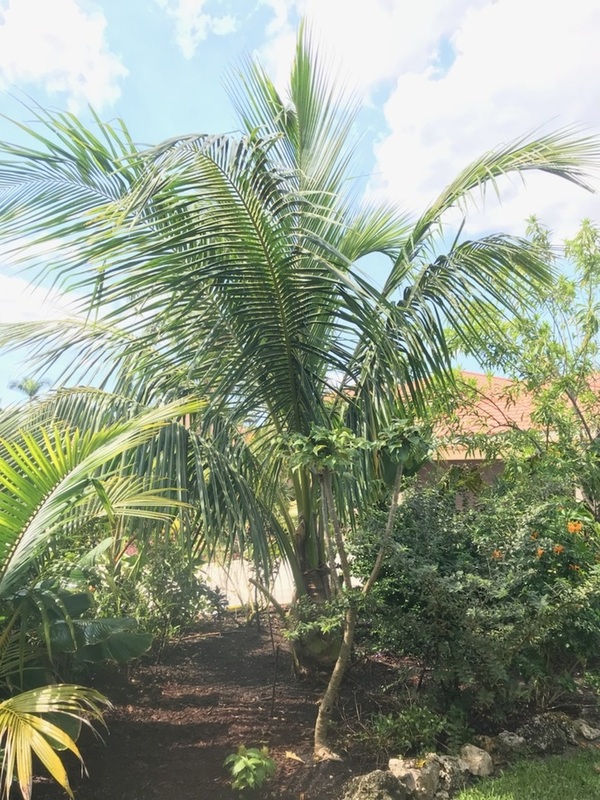 This is assuming you have the space to fit it, as I've heard Fiji dwarf coconut palms are actually quite small for a coconut palm (correct me if I'm wrong). If you had all of that, would you be able to keep it happy and healthy enough to produce quality coconuts? This is also taking into account that space, funds, proper pollination, and any other limitations outside of climate are out of the picture, since it's just a theoretical question. This is all in theory, as I know this is both very inefficient and difficult to do, but I have seen no straight examples of it (most likely for these very reasons), and was just curious if ya'll think it could be done. Thanks again for being a great community! I'm glad to be a part of it.